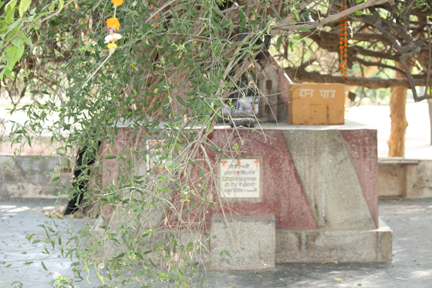 100 kms beyond Alwar in Rajasthan in the Oran, or sacred grove, of Jugrawar Roondh, covering an area of 165 hectares and dedicated to Mehendipur Balaji (In North India, Balaji may refer to God in general or Hanuman in particular. Occasionally, it even refers to Shiva). 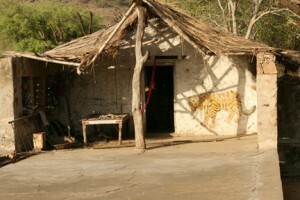 In arid Rajasthan, where summer temperatures regularly go up to 50°C, Orans provide shade, fuel wood, fodder and even food and livelihood for humans and animals. 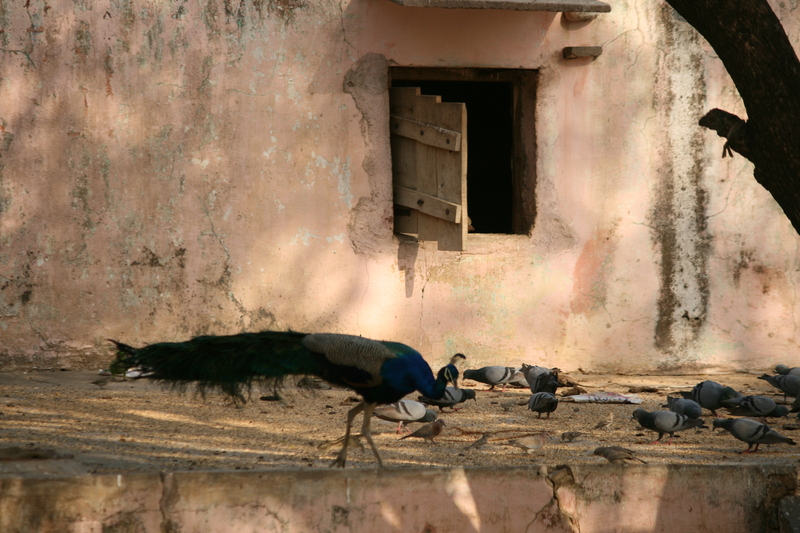 They are controlled by local communities in a complex management system that has played an important role in the ecology, politics and history of Rajasthan. It is an excellent study of how local communities protected their common resource base and provided food and water for animals in harsh and arid conditions. Oran is derived from the Sanskrit word aranya, meaning forest. Orans are patches of jungle preserved in the name of local deities or saints. They are also known as Dev Bani (ban = forest) or God’s forests. Aranya or the forest was the place where the Aranyakas (“Forest Books”), a part of the Vedas, were written. One wonders whether the orans, which have exclusively retained the “aranya” in their name, were the location where this happened. Delineating an Oran is marked by a ceremony whereby Ganga water or saffron milk is poured around a specific area within the forest, which is thereafter declared to be an Oran or Dev bani (God’s forest). This ceremony is called Doodh Jal or Kesar Chaanta, and marks the boundaries of the sacred grove. Oran or Devbani refers to sections of forests protected in the name of a local god or goddess. They are dedicated to one or more deities revered by the local community and can therefore be termed as sacred groves. There are about 25,000 Orans in Rajasthan covering an area of about 600,000 hectares. About 1100 major Orans cover 100,000 hectares. Of these, nearly 5,370 sq. kilometers are Orans in the Thar Desert. The largest Oran – 15,000 hectares – is situated in Bhadariya district of Jaisalmer. Some may be as small as a few square metres. 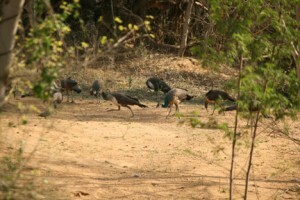 There are about 300 identified devbanis in and around Sariska National Park. Orans are rich in bio-genetic diversity and are a refuge for wildlife. 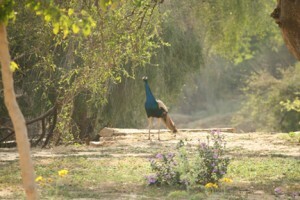 Rajasthan is vertically cut in to two, north to south, by the Aravali hills. To the west of the Aravalis is the Thar desert. There are about 7.5 million pastoralists and 54.5 million livestock in Rajasthan, all dependent on the Orans. 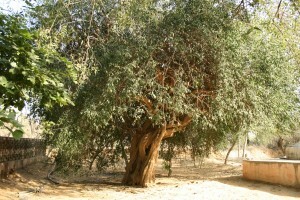 The Orans of the Bishnois in the desert district of Jodhpur are famous for the protection accorded to the Blackbuck and the Khejri (Indian Mesquite/Prosopis cineraria) tree, which are sacred to the Bishnois. 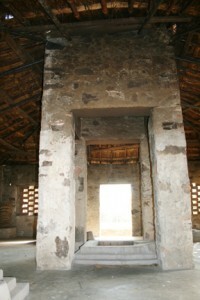 In fact, all Orans are the focus of local religious activity, which may take the form of a shrine, temple or sacred stone. As sanctified space, they are the focus and meeting ground of local affairs: politics, crops, livestock and the management of the Oran itself are discussed here, and punishments for offences like encroachment and destructive extraction are levied around the temple or shrine. The local committee (or panchayat) is an important feature of Oran management… “but the ultimate authority remains with the deity; divine retribution is locally perceived to be decisive in motivating compliance to rules, and cautionary tales of supernatural punishment by blinding or paralysis are common.” Puja (prayer) is regularly performed within the Oran, with special ceremonies held during times of hardship and drought. At the annual mela (festival) of the Orans, the local communities reaffirm their commitment to the forest and the deity. Van Samitis supervise the utilization and maintenance of the Oran, to ensure that there is no deviation from the village-appointed rules. A noteworthy aspect of Oran management is the presence of a mahatma, baba or priest with a socio-cultural role. 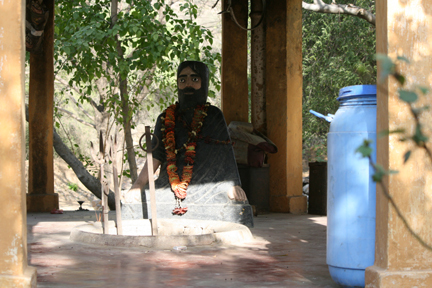 Taking on the dual roles of watchman and sadhu, the mahatma resides in the Oran and keeps watch over the forest and its inhabitants, in exchange for basic provisions from the community. The mahatmas and Babas have been instrumental in fostering a reverence for nature and protecting the groves. At the Jugrawar Roondh Oran, every family has to contribute a sack (about 5 kilos) of grain from the first harvest to the Oran. This is stored in a small bunker and the Baba who lives therein spreads it out on a platform every morning and evening. Proud peacocks, unmindful of human visitors, strut about boldly to feed among deer, squirrels and several varieties of birds: it is a sight to behold. The Orans conserve valuable water in the ponds, reservoirs, step wells (bawdi), streams and springs that are an essential feature of the Oran. Since Rajasthan has access to barely 1% of India’s water resources, all Orans contain a protected water source, thereby recharging groundwater and ensuring respectable water levels. The Orans also protect local livelihoods and provide MFP (minor forest produce) that are collected from the Oran and used or sold. 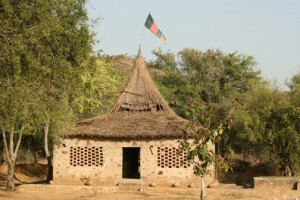 Fuel wood and fodder for animals are available here; grasses are gathered for basket-weaving, clay for pottery and leaves for making brooms. Honey, fruits, seeds and medicinal plants are the MFP (Minor Forest Produce) available for local use or the market. 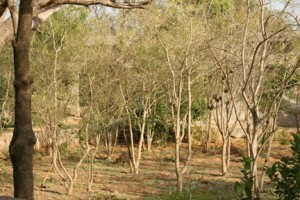 Nesting birds, such as owls, parakeets and woodpeckers, build their homes in the khajjur and other large trees, assisting farmers by eliminating insects and other agricultural pests. 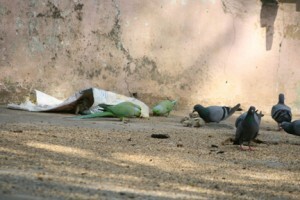 Like sacred groves found elsewhere in India, each Oran has a set of unwritten rules regarding the use of its resources. Tree-felling for any purpose other than funerals, repair of sacred structures or religious feasts is totally prohibited. Although it is permitted to collect dry wood for domestic fuel wood requirements, most households use cow dung, gas or wood provided by the Forest Department for their fuel requirements. 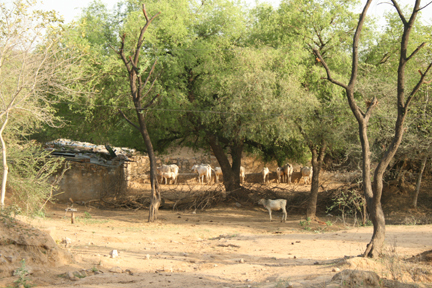 A primary function of Orans is grazing: after all, Rajasthan is a livestock-dependant state. In some Orans seasonal grazing is permitted; in others grazing is permitted only en route to other pastures. While collection of leaves for fodder is forbidden, allowance is made for poorer households or during periods of severe drought. But large-scale extraction of any resource is strictly outlawed. The survival of people and animals in this dry desert state has been possible because of their judicious management and use of natural resources, especially the Orans. The Oran is a traditional grassland management system which has also conserved the gene pool of indigenous species. Today, even as governments spend large amounts on protecting reserved forests and wildlife sanctuaries unsuccessfully, they are unable to provide the protection that existed in the ancient sacred groves, where local communities took direct charge of their own environmental needs. The public perception of the Oran is primarily as a common resource base. Unfortunately, as land becomes scarce, the Orans are also shrinking. The Rajasthan State Forest Policy (2010) acknowledges the importance of the orans / devbanis as “islands of good forests and repositories of rich biodiversity. These orans / dev van are excellent examples of people’s religious faith linked with conservation.” They have promised to provide financial and legal support. However, government funds are handed out by bureaucrats who may make the community dependant on them and their rule books. 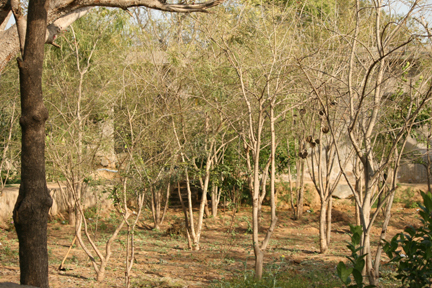 Orans, like sacred groves elsewhere in India, are a direct result of the people’s conservation efforts and local management systems. This excellent tradition should be left untouched. It is a fascinating idea that our sacred Vedas, especially the Aranyakas, were written in these silent forests. At least for this reason – if not for their important ecological role – they deserve to be preserved. 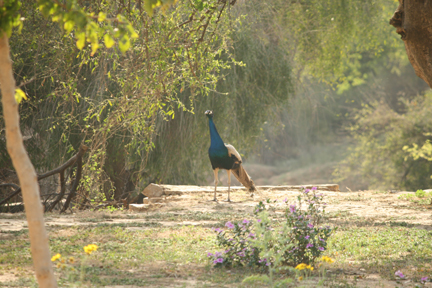 KRAPAVIS has a very deep and effective reach and understanding of the Sacred groves in the Sariska area (Rajasthan & Gujarat). It is very fortunate to witness a positive use of religious beliefs of the communities. It is like if God has given you a lemon, (in this case; arid climate, poor community, religiously united, Needy, scarce resources, etc) make lemonade out of it!!! (in this case; create DEV BANIs or Sacred Groves for benefit of all)!!! I am very pleased and hopeful of endeavours of Mr. Aman Singh and his team at KRAPAVIS for a positive change and local as well as overall benefit from his work in the area of environment conservation. The website Heritageonline.in is very informative and interesting website. It caters different stakeholders in general who are deep rooted with their culture and tardition. My best wishes for more enriching information in coming days. I have visited few of the urans. They symbolize our rich tradition of conservation through community participation. I would like to compliment you for this excellent work through Heritage online. I am sure this website can bring together many such useful information on our cultural facet of conservation. Is’nt it facinating that we are merely rediscovering what our ancestors did in our efforts towards conservation. Thanks for a very enlightening article – and a very encouraging one. Great site, very informative. Look forward to reading more such articles. It is wonderful to read about the Orans — the sacred groves of Rajasthan — and especially that there are so many of them left, all due to their faithful preservation by local communities, following the traditions handed down through countless generations. If the world is looking for a model to follow of how we can relate positively to the earth and the animals, one need only look to the sacred groves of India. This is truly fascinating! The photos are beautiful! Excellent initiative! Will make us aware of all the hidden gems of our country – sometimes forgotten but mostly ignored. Unearthing them will go a long way towards creating an awareness on the need to to protect and preserve our rich heritage.